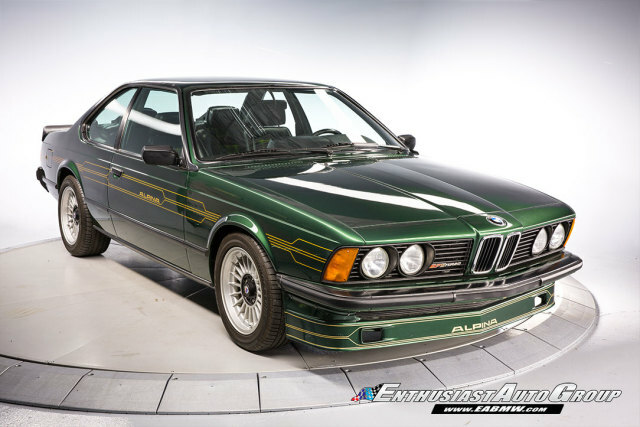 *New Arrival* Alpina Green over Green Tartan Cloth, The pinnacle of E24 Alpina Production! 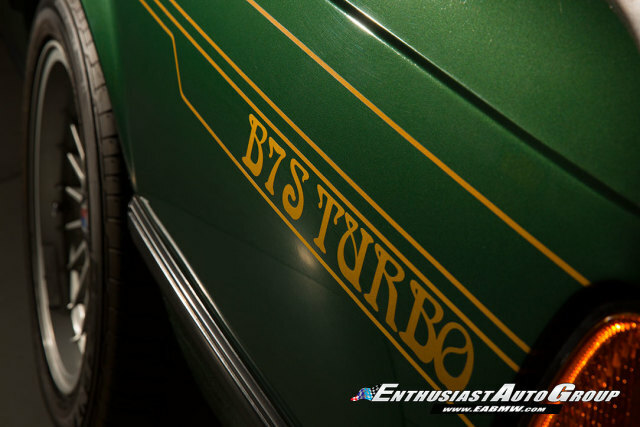 This B7S Turbo Coupe is #25 of only 30 vehicles built worldwide! One of only four examples produced with a proper manual gearbox. Extremely low, original mileage of ONLY 32,210 kilometers! This B7S is one of the best known surviving examples; truly a special car for the discerning collector. Built as a one-year only model; the B7S produced more power than nearly everything else on the road, developing 326 bhp and 370 ft. lbs. torque! It was a monster for this time period and still is an excellent performer today. 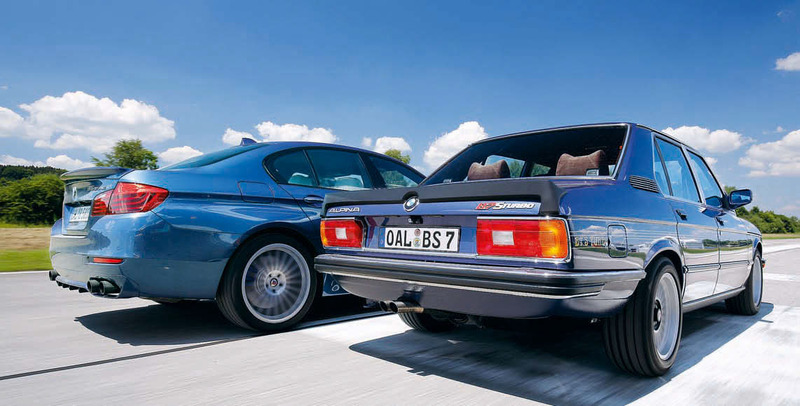 Based on the BMW 635CSi, each B7S Turbo was hand-built in Buchloe, Germany. Few original cars survive today and they are extremely rare here in the United States. The condition of this desirable example is amazingly well-preserved! The exterior paint shows excellent throughout complimented with the shadowline trim. The original interior has survived well with only minor wear present. 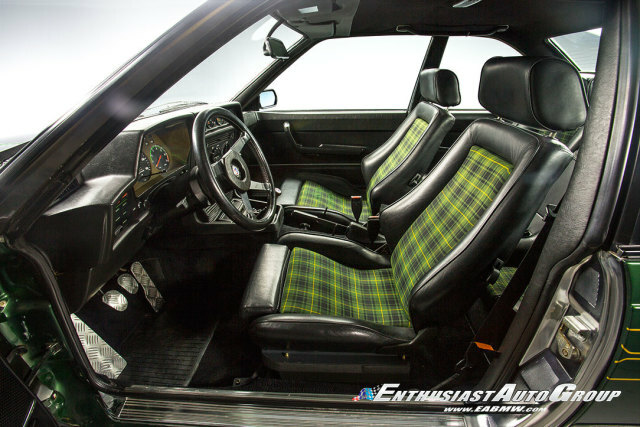 This car is believed to be one of only two surviving vehicles with original Tartan interior. This coupe has not seen inclement weather or ever spent a night outside. Super clean body + undercarriage with no rust or corrosion. Alpina-engineered enhancements include a modified cylinder head, lightweight pistons, performance camshaft, high-flow exhaust header with three-inch exhaust piping, Getrag close-ratio sport transmission with Alpina HD clutch, Alpina engine oil cooler, limited slip differential with Alpina oil cooler, larger front brakes, Alpina bespoke interior with steering wheel, 4-pod gauges set with boost, running gear temperatures and pressures. 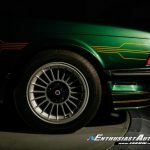 Exterior bodywork includes staggered 16″ Alpina Wheels, front and rear spoilers and the full Alpina Deco-Set. 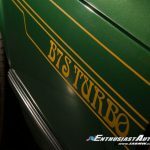 The original pierberg fuel injection system has been updated with a Motec injection management system (all original pierberg parts included). 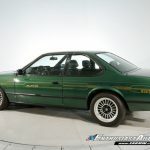 EAG has completed our Comprehensive Pre-Purchase Inspection ensuring this Alpinas mecha www.EAGBMW.com Enthusiast Auto Group is a highly specialized automotive facility focused on late model BMWs. In addition to BMW sales, we offer precision automotive service and performance upgrades. Our pre-owned inventory is meticulously selected with the highest quality standards then thoroughly inspected and serviced by our master BMW technicians. EAG never fails to impress with the examples that it turns up and out for sale. 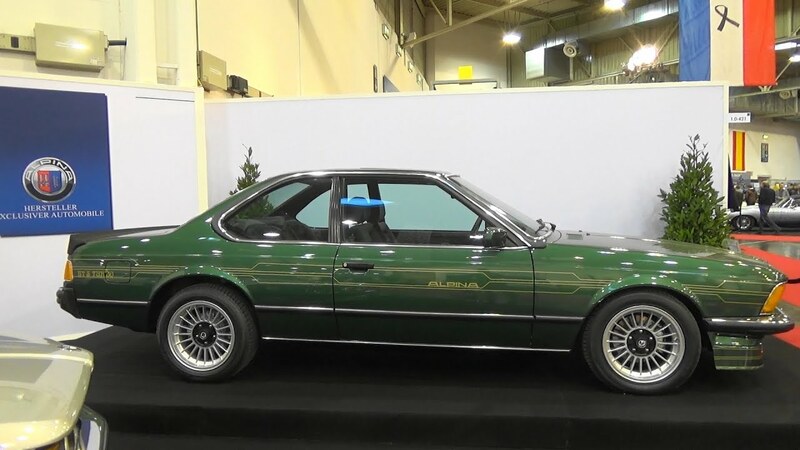 This is certainly no exception; the absolutely stunning Alpina Green over Green Tartan is mouth-agape beautiful and offset well against the early Classics alloy style (rather than the later covered centers which don’t match the E24 as well) and gold decor. With only 20,000 miles accrued, the car appears near perfect and should, considering its pedigree and rarity. 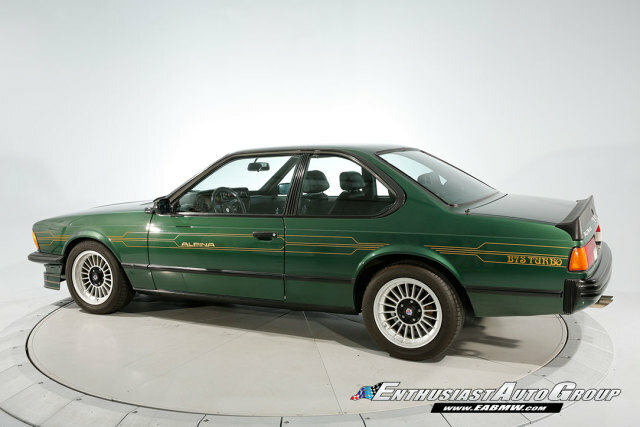 The Alpina Archives show the car from Japan in 2009 and in Utah until recently. 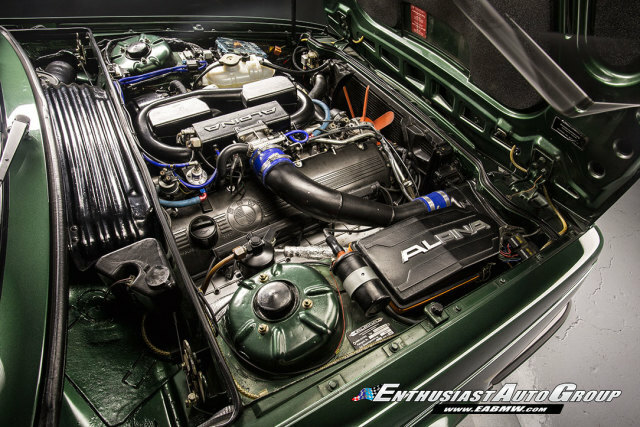 Little detailed history is offered, but the car presents as close to faultless. Unsurprising, then, is the asking price. I got quite a chuckle as Cars.com’s auto-fill which calculates monthly payments based upon a loan; in this case, a figure of $6,744. I usually spend less than that amount on entire cars, never mind a monthly payment for multiple years with compounding interest. But compared to some of the numerous Porsche offerings in the same ballpark, this ultra-limited and astoundingly beautiful B7S suddenly doesn’t sound so outrageous. Sure, this car constitutes more than what the average American will spend on a house by about $100,000 more and is enough to make the GDP of some small African nations envious. Envious is probably what you are, too – just like me. 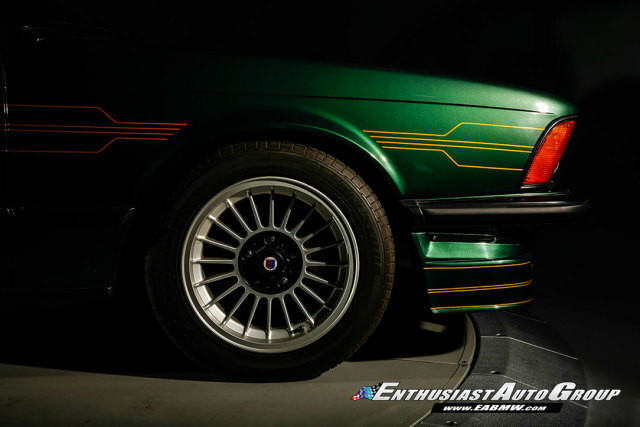 Tagged 1988, Alpina, Alpina DÃ©cor, B7, B7S, BMW, Classics, e24, M30, Tuner Tuesday, Turbo, Turbocharged. @Ian – you’re certainly right on pricing of these cars, it’s skyrocketed. 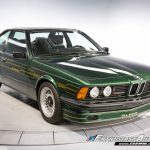 However, a few things to consider – could you replicate this car for much less than $60,000? I’m not sure you could. And would it be authentic? Don’t forget, not long ago $100,000 was outrageous for a M1, $20,000 was unthinkable for any other M that wasn’t new. Is this the new normal? It could very well be a bubble, but there have been historic periods where cars weren’t worth much and then sharply increased in value. Some never returned; exa., my grandfather bought a 1926 Bentley in the 1960s when it was quite an old car for ~$3,000. He also owned a 250 GT Lusso Berlinetta which he sold in the 1970s in the teens. 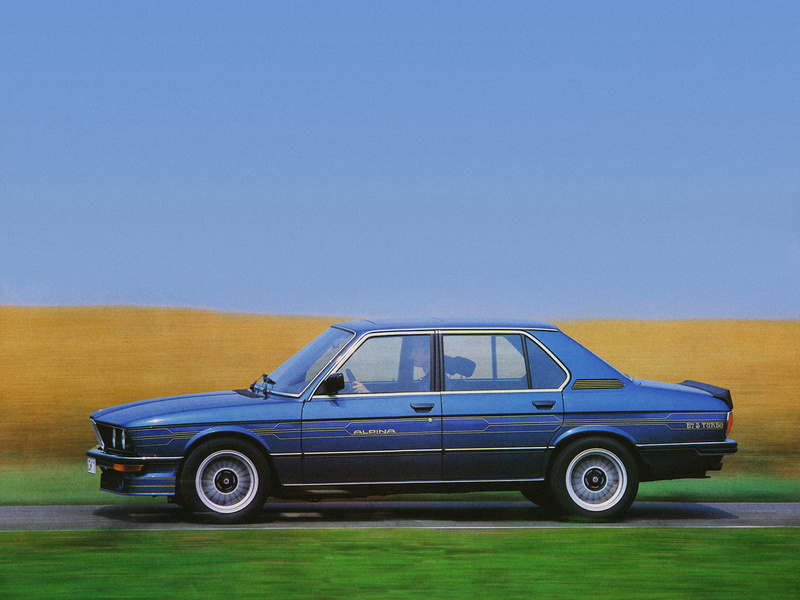 Point being, we can shake our fists at the sky and remember what was, and I totally get why you’d do so – I look at the E30 M3 and think “hey, that’s a $15,000 car.” But I can’t buy one for that, and it doesn’t seem likely that I ever will be able to again. Anyway, just food for thought. Re: diamond plate – agreed, I think that’s weird. But there’s a reason (I’m certain) that EAG left it there. They don’t just overlook details. So there’s some significance. Given the condition, yeah it’s like a one-off museum piece. But I agree that it’s way over priced. Maybe 150,000 to 200,000. It’s hard to say. No way this car gets sold at that ridiculous price. I won’t pay more than $20,000 for it.